I use this book in my coaching all the time. The first chapter on Coping and Surviving is immediately relevant for all those over-worked, frantic managers who live in reactive mode, tethered to their gadgets. From Or to And reflects on the balancing act of living in the midst of ambiguity and deciding among multiple “right” choices facing people every day. 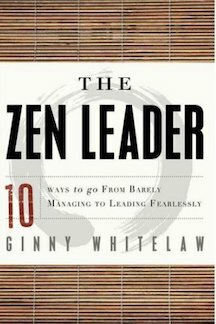 This book could form the foundational curriculum of any executive presence or broader leadership related coaching assignment. If you coach for behavior change and you are tiring of trying to change the mind with the mind, you may also peruse Ginny Whitelaw’s previous superb book, Move to Greatness about using the body, the immediate visual and auditory environment as well as everyday activities to find ease in different behavioral patterns… as multi-faceted an approach to change as human beings are complex.